Tom Simoneau is back on the show with Allen Estate Wines owners Ron and Laura Allen, who join Steve Jaxon and Dan Berger today. Allen Estate Wines winemaker Chris Taddei is here too. Barry Herbst is also back in the studio today, after spending a lot of time working on the setup for the new Bottle Barn online retail site. Steve begins by asking Ron and Laura to tell the history of their winery. Ron says that in Sonoma County, wine permeates you. Their children went to school with the families of great local winemakers. Talking to them, the Allens thought they could do it too, on a small scale, and set out to do it to the best of their ability. They started in 2005. Chris remembers that Ron had steel tanks in his garage. Ron and Laura have been married 22 years. She workid in the dot com world. Ron used to buy one great Bordeaux bottle per month, and never drank them. He still has the whole collection. No matter how little he made, he always found some money for his wine collection. He wanted to do something in the Bordeaux style, single variety, single vineyard. 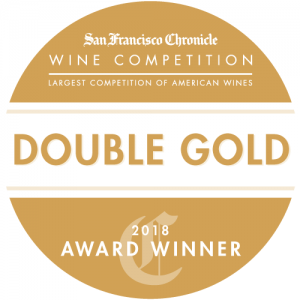 Allen Wines’ Audacieux won Double Gold at the SF Chronicle 2018 wine competition. Chris Taddei fell in love with wine in college. He worked in restaurants and started his own company. He had a small company that traded in motorcycles, mopeds and cars. He had a bottle of very fine wine once and got hooked into the whole culture of food and pairings. Flash forward, he met his future wife Laura, who was from the area. He wanted to make wine and now they do. They taste a Chardonnay called Provacateur. When Ron was making his wine in the garage, she noticed they had no Chardonnay. So she wanted to make some of her own. She wanted a clean wine, unfiltered. Some of the wines from around there disagree with her, mainly whites, and she had a specific type of Chardonnay in mind that she wanted. So their winemaker Chris Taddei decided to make a “clean” wine. He explains that clean can mean a lot of different things. Fermentations can cause histamines, secondary fermentation can too. He uses very low sulphur, 18-36 months in the barrel. The wines they made didn’t make her sick. Bob Cabral explained this to her and she asked Chris to make the wine with the smallest amount of chemicals possible. This extends to the vineyards too. Ron explains that in a wet environment with rain and fog, you have to manage the grapes to have healthy vines. They never have to blend anything to correct it. This wine is nicely balanced, says Tom. Laura says she loves blind tastings. She describes this wine as having half old-style oaky and half steely and acidic. Tom says it has lemon and butter together. Ron says it’s about 30% ML. Laura says it’s not syrupy. They stir the lees every week. This goes for $46. Ron explains that she is in charge of all their white wines and he takes care of the reds. Barry tells about the new Bottle Barn online operation. The site is live. You can buy individual wines, sampler sets and they will have flash sales. There will be some great bargains and there is free shipping of 6 bottles or more anywhere in the country. Tom and Steve have been talking about wine on the radio since 1991. Steve tells about how they came up with a ratings scale based on the number of wine stains produced by the wine. For example, 3 stains would be a good one and a great one would rate 5 stains. Steve also talks about Della Toffola USA, the producer of high quality winemaking equipment with offices in Santa Rosa. They will be on the show in a couple of weeks. Chris Taddei mentions that he knows the company, their equipment and their service personnel which are all first-rate. After the Provacateur, they will taste a barrel sample. The Provacateur was a Russian River Valley Chard. This barrel sample is Sonoma County Petaluma Gap. Ron says that both of these are from the Wente clone, but they have two different flavors. They make about 400 cases of Provacateur. They limit their production to about 2000 cases so their operation is not too large to keep on an artisan, boutique scale. Next they taste some red wines. First, a 2015 red called Block 17, Audacieux, which means “audacious” in French. It is very bold, single vineyard, single varietal. Their lion logo is prominent on the label. Chris describes the vineyard. He takes pride that “what we pull out of there is worthy of putting in the bottle.” He gets 2 or 2.5 tons per acre, meticulously farmed. The color on this wine, says Tom, is unbelievable, bright purple as if it has a black light below it. It’s Cabernet and very fruit forward. Ron explains that barrels can be between 1 and 5 years old. Some oak is dried for 5 years, and is more expensive. Ron says the right barrels give you the subtlety they want. Tom describes a pencil lead flavor. Chris says that some of the greatest Bordeaux wines he has tasted have that. Steve would prefer to call it toasty oak and doesn’t like the term pencil lead. The list price on this is $56. Ron says they could charge a lot more for it but they choose not to, so it is available to the average person. Chris talks about the handful of vineyards he has been working with for the last ten years. Next they taste another one that has 3 years in barrel, a 2014, from Oakville, another 100% Cab. This was the double gold winner. Tom was a judge in that competition. He heard about the Audacieux wine and he sees that all 3 judges picked it as gold, with no conversation. All 3 judges gave it Gold with no discussion, which is rare, and a good sign. Chris adds that all of these vineyards are hillside vineyards. He thinks that hillsides produce some of the greatest fruit. You’re up out of the heat and fog but you have to deal with tannins. 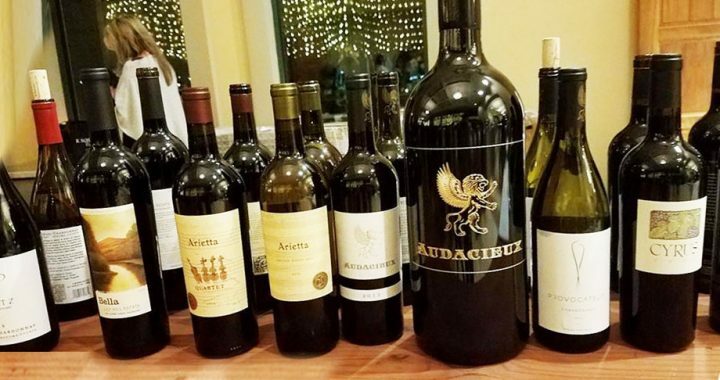 They do tastings in Napa and Sonoma, by appointment, which can be arranged by contacting them through the Allen Estate Wines website .